Plus Model, of the Czech Republic, offers a variety of products to enhance our scale models,dioramas and bases. With so many modelers making use of bases and foliage, I felt it was high time to write a quick review of this product. Even though these have been out for awhile, there may be modelers that are unaware that these are available. 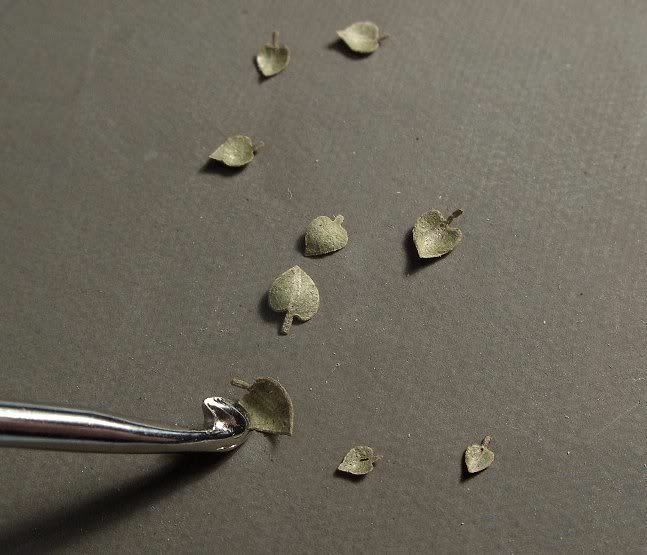 The leaves are packaged in small plastic boxes, much like what small pins usually come in. The only downside of these boxes is that in winter time static electricity may cause a few to stick to top of the box, so take care when opening. Containing approximately 100 leaves per box, Plus Models offers these in Oak, Birch, Cherry, Linden (or Lime as some know it by) and Maple. These are made by a Laser Process, so the edges are excellent and the center part of the leaf and stem is there, making them very realistic looking. The leaves are available in various colors, which range from Natural color (brown) and leaf green. I first bought the Natural color as I was doing a base from the late fall and the color was more in line with the time of the season. Since then, I have added all the natural colors of the five different trees. Maple and Oak are also available in Extra Colors, which include different shades of reds, browns and greens. After seeing all the high dollar PE sets for leaves, this a great product. These are easy to apply, just a tiny drop of white glue on the backside should do it. I say pick up a set for your next Diorama or Base and have a real different look of things! I picked these up at Military Miniatures Warehouse for $5.99 a box. Highs: Great color and thickness.Quality is very good, and so is packing. Good variety. Lows: No lows I can see. Verdict: Colors are great and no real painting is necessary. Fair price for a very useful product. I picked up some of these at AMPSEast last year. And they a re beautiful. I have not tried water but what I did was put them on a soft pad, 8000 micro mesh sanding pad in this case, and took a #2 crochet needle I use for burnishing and rub the point around in a tiny circle. The smallest in this pic is 1.5 mm and the largest 3mm. These are the Cherry leaves.